The IACA Excellence in Currency 2017 Coin Awards were conferred during The Coin Conference in Warsaw on October 24, 2017. 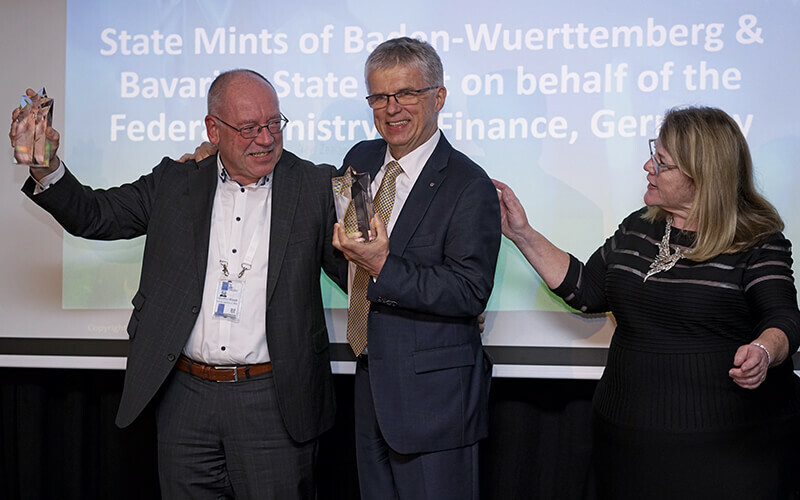 The State Mints of Baden-Wuerttemberg and the Bavarian State Mint were awarded the prize for Best Coin Innovation for their coin featuring a polymer ring. Every two years, the International Association of Currency Affairs bestows the distinguished IACA Excellence in Currency Awards. On October 24, 2017, a German product was thus recognized: the tri-material 5-euro coin with polymer ring was labelled ‘Best Coin Innovation’. Thanks to the polymer ring inserted between the ring and the core, a coin becomes as secure as a banknote for the very first time. The colored polymer ring is not only attractive but also constitutes an overt security feature that is easily discernible for every user. At the same time it offers the possibility to equip the coin with covert security features which no counterfeiter is able to copy at the present state of the art. The new polymer coin would thus make an ideal material for raising the coin-note-boundary. This is an important issue as various countries currently contemplate raising this boundary. The International Association of Currency Affairs (IACA) that presents the IACA Excellence in Currency Awards every other year is an organization that unites central banks and ministries of finance, mints, security printing companies, and many more institutions and companies involved in the cash payment cycle. Composed of experts, an international jury decides every two years on which nomination should be recognized with an award. 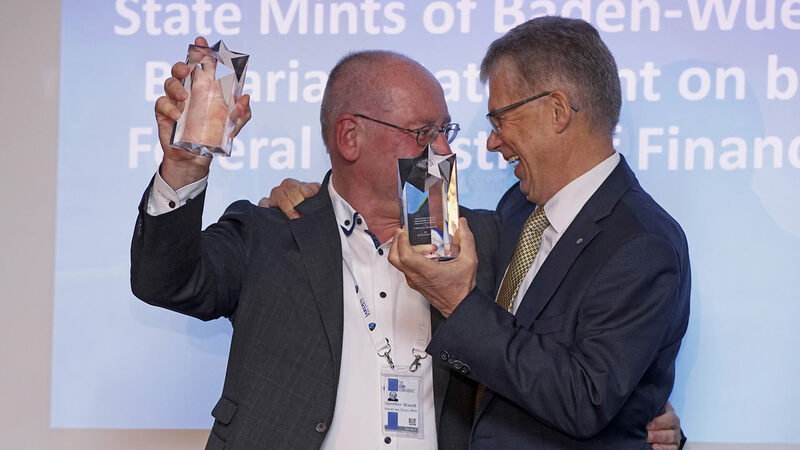 In contrast to the more widely-known COTY (= Coin of the Year Award), the IACA Excellence in Currency Award exclusively focuses on circulation coins and concentrates on solutions that are ground-breaking for the entire minting industry. This constitutes already the second prize of the professional world with which the polymer coin can adorn itself. In 2016 it won the MDC Award in the category ‘Technologically Most Advanced Circulating Coin’. The Mint Directors Conference (MDC) is composed of representatives of mints from all around the globe. The German State Mints of Baden-Wuerttemberg and the Bavarian State Mints were at the forefront of developing this creation. They were supported by the Leibniz Institute at the Rheinisch-Westfälische Technische Hochschule (RWTH) in Aachen as well as by representatives of the German Bundesbank. Further major contributors to this development were the vending industry through a representative of Crane Payment Innovations at Buxtehude and representatives of the blank supplier Saxonia EuroCoin.